Jewry Street serviced offices is a modern building that is situated conveniently for Aldgate tube station. The business centre has excellent transport facilities close by with Liverpool Street train station not far away with networks to many destinations. 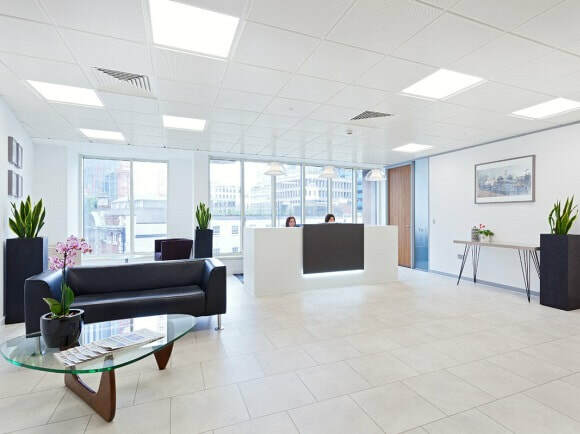 Refurbished to a high standard, this beautiful office space for rent has a variety of facilities available at the site including a large reception area that is fully manned, boardrooms and lounge or seating areas. Other features include air-conditioning and 24-hour access to the building. The office rentals themselves come complete with desks, storage units and chairs as well as phone handsets that are digital. There are also inbuilt answering machines in all telephones. Internet services are installed in all suites and there are connectivity points pre-installed ready to use at short notice. Local amenities are excellent with a range of shops, restaurants, and cafes in the surrounding area.